In the early 2000s, Richard S. Wheeler, author of more than 70 titles, proposed a nontraditional and risky series to an editor. While the traditional western depicts courage at arms or in combat, these books would depict moral or ethical courage. Wheeler felt it was time to expand the genre, open it up to other stories about the settling of the West with novels in which the heroes simply do the right thing. 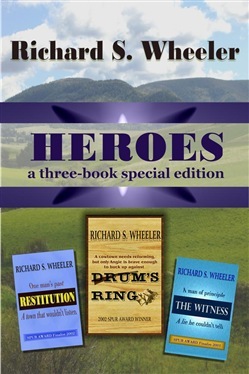 The editor went for it, and the three books of HEROES were published by Signet/NAL as mass-market paperbacks.Restitution deals with a former bank robber who has gone straight for years but feels a need to repay what he stole—at whatever the cost.The Witness involves an employee whose powerful employer wants him to tell lies in court.Drum’s Ring depicts a weekly newspaper editor who discovers that her son, the mayor, is corrupt, and finds the courage to expose him, no matter the price.All three books were honored. One received a Spur Award; the other two were Spur Award finalists. 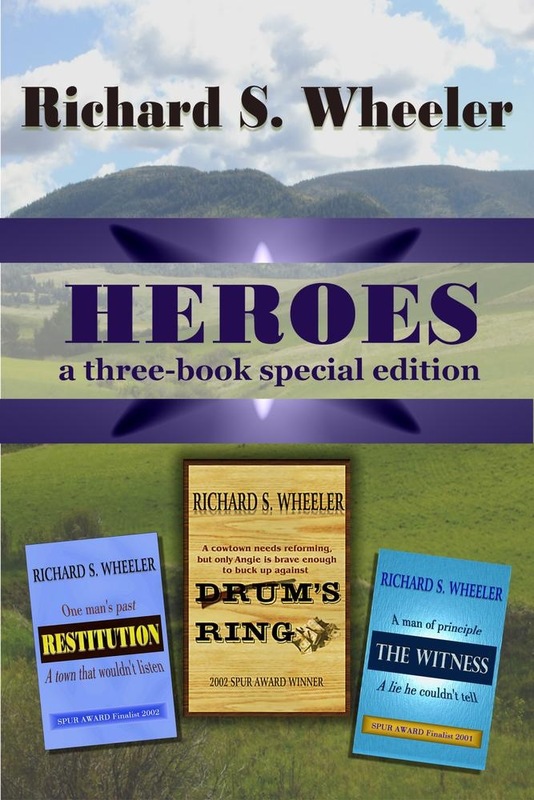 This three-book edition, HEROES, is a tribute to the courage of many people who settled the West, and also to Richard S. Wheeler who could see the need to portray these heroes. Acquista Heroes in Epub: dopo aver letto l’ebook Heroes di Richard S. Wheeler ti invitiamo a lasciarci una Recensione qui sotto: sarà utile agli utenti che non abbiano ancora letto questo libro e che vogliano avere delle opinioni altrui. L’opinione su di un libro è molto soggettiva e per questo leggere eventuali recensioni negative non ci dovrà frenare dall’acquisto, anzi dovrà spingerci ad acquistare il libro in fretta per poter dire la nostra ed eventualmente smentire quanto commentato da altri, contribuendo ad arricchire più possibile i commenti e dare sempre più spunti di confronto al pubblico online.